I'm from Brazil and I really enjoyed the funk show today, I would like for you djs to play brsileiro soul. Happy New Year - glad you're still here. 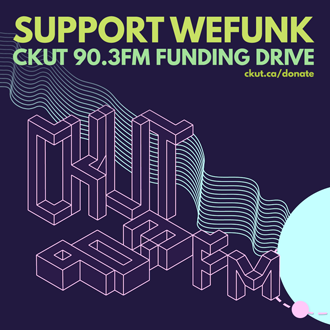 WEFUNK serves up a generous helping of grooves to kick off this year's CKUT Funding Drive, with standout Jamiroquai and Calvin Harris remixes, stone cold boogie from Goldie Alexander, boombap classics and sample moments, plus a spotlight on James Brown's cinematic exploits with our good friend Duke Eatmon. DJs & GUESTS Professor Groove, DJ Static, Duke Eatmon / RECORDED October 20, 2017 / HOSTING PJ, Mike, Oliver & daduke. You can help too!